Your guests will feel like they’re dining at the most high-end five-star restaurant when you decorate with a set of exquisite wedding napkin rings. 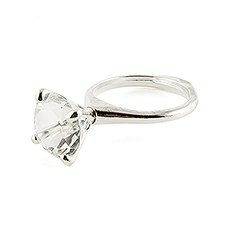 These beautiful rings are not only elegant and upscale, but also highly functional. In fact, many of our affordable wedding napkin rings are equipped with a special place to indicate guests’ names, so they double as great-looking place cards. We have napkin rings for weddings of all themes and styles, including silver, gold, diamond, wood and ivory options, to tie together your one-of-a-kind table décor. 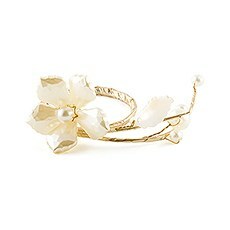 For something utterly elegant, explore our selection of beautiful pearl and gold wire napkin rings. For wedding receptions that err on the glamorous side, we have exceptional silver-plated diamond napkin holders that steal the show with oversized glass diamonds. The Knot Shop is also on hand to help you tie together your antique or rustic table display with wood veneer place card napkin rings that provide a down-to-earth texture. 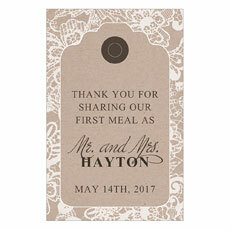 You can also add a personalized finishing touch when you opt for a custom-made napkin tag with an extra-special message.